Are Those Dogs In The Basement? Hello. Three cheers if you got here by clicking on a link on the Resonance FM website some time between the hours of 22.30 and 23.00 on Saturday 28.04.2012. Three cheers indeed. I hope you enjoyed trying to guess whether the mystery item was a window, a wall, an orange or Mr. Benedict. Or hearing about the Benedict’s adventures ordering sherry. And if this is your first visit to my site, feel free to have a look round, and perhaps buy yourself a cassette. If, on the other hand, you have absolutely no idea what I’m on about, don’t worry. It was just my little attempt to use up thirty minutes of spare airtime with something silly. I’ll fill you in on the details later. Work continues on the project slowly but surely. Please also note the picture taken by celebrated Lomographer Hannah Brown, who was recently my guest at Bush House and took a whole roll of beautiful photos of the building in it’s final days as the home of a major international broadcaster. All will shortly be unveiled. Sorry to be continuously dangling the carrot like this. But I’m afraid I must dash as I have to lock up the studio early. Please excuse the mess. Remember a few weeks ago when I was going on about the Dexter Bentley Hello GoodBye Show on Resonance FM auctioning off their airtime at the rate of £10 per minute, with all proceeds going to help keep the station on air? Of course you do, we’re great friends, you and I. But in case you missed this very fine show, it’s now available for podcast here. There’s plenty to get your ear-teeth into, including offerings from Dexter Bentley stalwarts Sergeant Buzfuz, Little Sparta, Chips For The Poor, and a highly arousing Joy Division cover by Datasette. And, most pertinently for our own concerns, there’s an exclusive three-minute radio advert ‘How To Sell 50 Orange Cassettes Without Being Really Trying’ by Guy J. Jackson & Robin The Fog. A veritable feast for the ears. But wait, there’s more! This week just happens to be something of a milestone, as The Hello GoodBye Show celebrates nothing less than a decade of broadcasting on Resonance 104.4 FM with a FREE event at Tate Britain on Friday 13th April between 18.00 – 21.30 hrs. Expect a lively night of music, performance and dance (yes, dance, that’s what it says here) featuring live sets from Way Through, The Skinjobs and the aformentioned Sergeant Buzfuz’s Holloway Tales. I shall most certainly be joining them and hope you will too. But there’s still more! 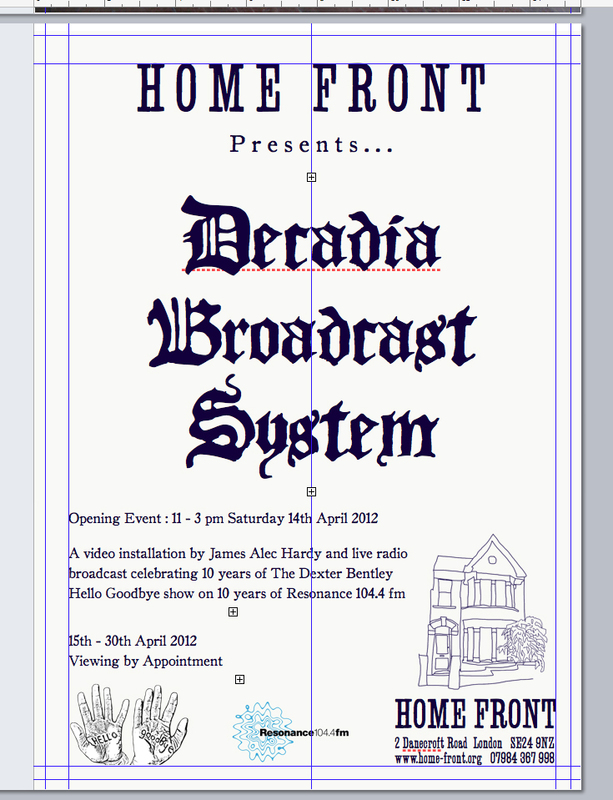 The anniversary party spills over into the following morning, with a live broadcast between 11.00 – 13.30 hrs from Home Front Gallery in Herne Hill, South London for the opening of the artist James Alec Hardy’s Decadia Broadcast System exhibition, an archive of video footage shot behind the scenes at Hello GoodBye over the years and shown as a temporal monument, in the form of a totemic street sound system. 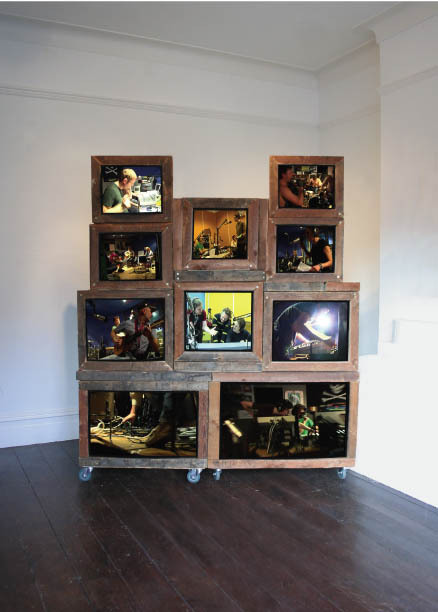 As I’ve mentioned before, I spent five happy years as a sound engineer serving this Resonance institution, and genuinely count those Saturday afternoons squeezed into a small studio amongst mounds of instruments, amplifiers, musicians, small children, strategically-positioned buckets and the occasional spaniel as some of the happiest times of my life. Each week I was amazed anew at the variety and quality of artists they managed to add to the pile; and at how the show always somehow managed to go out on time, despite our soundchecking six bands right up to the very last minute while trying to fix the fusebox. Anyway, I’m drifiting. See you on Friday. And again on Saturday. And together we will raise a glass and wish them many more years of happy broadcasting. Dexter Bentley – we salute you!